A few weeks back, I was talking with the group I’m coaching and the topic turned to sauce. Specifically, how a good sauce can really make all the difference to your cooking. In fact, I’d be willing to go as so far as to say that after learning to season properly, having a few super tasty sauces in your repertoire is the easiest way to take you cooking from ‘OK’ to ‘ah-maz-ing’. So today I’m going to share my 10 favourite ‘secret weapon’ sauces that really make a difference to my cooking. There are few things more versatile, delicious or healthy than this Middle Eastern-inspired sauce. 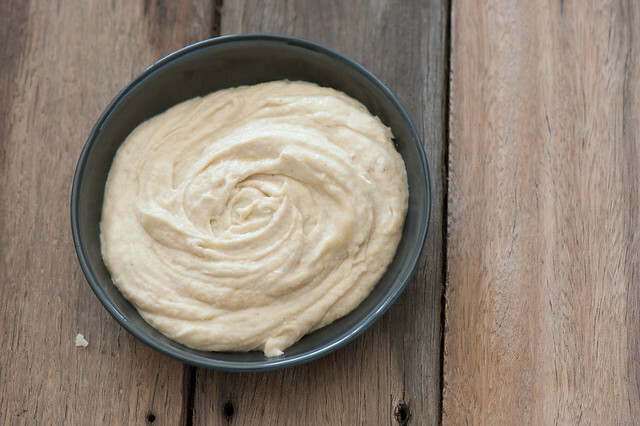 I’m currently in love with this Roast Cauliflower adaptation but if you’re a purist you can’t go wrong with a good classic chickpea based hummus which is quicker and easier to make. After mastering the art of making mayonnaise in the food processor, without it splitting, mayo consumption has definitely increased in my house. I use it on an almost daily basis with poached eggs, to add substance to a lunch time salad or as a sauce for meat or fish. Dangerously addictive. Inspired by the Turkish sauce, ‘tarator’. Similar to hummus but a little more complex with the lovely nutty flavour. Traditionally served with fish but lovely anywhere you need a creamy, nutty sauce with a bit of a kick. I often make it with other nuts as well. If I’m feeling flush I’ll use pine nuts but it’s also wonderful with roasted hazelnuts or almonds. I pretty much always have a bottle of chilli oil in the pantry. Great for adding instant heat to dishes in need of a little help, or when you’ve purposely left the chilli out to please tiny-people taste buds. It’s also a wonderful sauce in its own right to serve with chicken, pan fried halloumi, drizzled over soups or even a simple pasta with fresh rocket (arugula). My Irishman love it with his morning eggs and avocado. If I don’t have time to make hummus or roast cauliflower hummus mentioned above, then I whip up a bowl of this dream. Basically just combine equal parts Greek or home made yoghurt with tahini. Season with salt and a splash of lemon. Sometimes I add finely smashed garlic but if I’m really short on time, I don’t bother. Use it any where you’d normally use hummus. Especially good as a sauce for fish. I’m also currently in love with this slightly more complex Tahini Miso Turmeric sauce but it requires blending so I only make a batch when I have more time. When I’m really pushed for time, this sauce is a savour. Basically take some good quality full fat yoghurt or Greek yoghurt and season generously with salt and pepper. And your sauce is ready. If you want to fancy it up you can stir in chopped herbs, grated cucumber or zucchini or a little garlic. But really the ‘plain Jane’ version is always a winner. If I’m in the mood for something a little richer I mix equal parts yoghurt and mayonnaise. So good! A wonderful dairy-free pesto that’s my go-to when I’m lucky enough to have masses of fresh basil in the garden. Every year before the first frosts I make a gigantic batch of this pesto and freeze it in ziplock bags to dip into during the dark Winter months. Wonderful drizzled on soups, tossed through roast veg or cooked pasta (or both), to make green eggs or slathered on some Broccoli Bread Toast. A Chinese classic that’s fabulous with chicken. I had forgotten about this punchy fresh sauce until I was doing some research for this post. Thank heavens I have a blog to remind me of my past favourites! I just LOVE this sauce especially in the Winter when fresh basil is hard to come by but beets are abundant. Although if you’re a purist about these matters, you’d best skip on to the next sauce. Basically the idea is to replace the fresh basil leaves in pesto with cooked beetroot. Just heavenly. Would win the award for the ‘prettiest sauce’. A combination of classic ingredients from two very different cuisines – Japanese and Moroccan. Normally I’m not a fan of ‘fusion’ cooking but I make an exception for this richly complex sauce. Since being Low Carb this Miso Harissa Ketchup is now my go-to when I want a healthier (and way more tasty!) take on ketchup. It’s also amazing toss on roast veggies, especially roast cauliflower. Sauces are my best friends in the kitchen! Although I’m a lover of many different sauces, pestos of all sorts are my favorites at the moment. Experimenting with using them beyond just as a topper(such as stirring them into dishes before cooking) is really fun. Oh yay for pesto Samantha! I had some for lunch today with poached eggs and salad – soo soo good! I’ve never really gotten on the sauce bandwagon. The only time I use one, generally, is when I make your stuffed sweet potatoes. On the occasions when my stomach can handle green chiles, I make an aioli (with lime and cilantro) to go with them, which makes the green chile cheeseburgers. My husband and I both tend to prefer things like grilled meats plain – not marinated, and not sauced. Fergal my 4-year-old isn’t a sauce fan either… I guess it makes sense that some people aren’t into sauce… although your lime and cilantro aioli sounds amaze-balls… AM going to have to steal that idea! mix and smear over fish like tuna or salmon and place under grill for 10-12 min.YUM YUM YUM!!! Loving the sound of Wasabi Miso Mayo Jessica!